Dave 'Santa' Coates got into the festive spirit (& suit !! 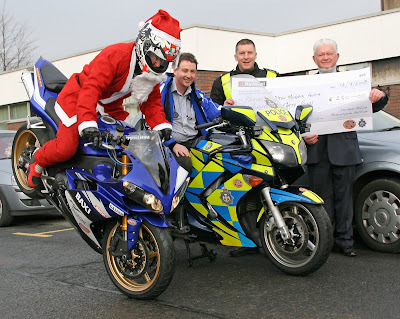 ), to 'stop' at Darlington Memorial Hospital and present a cheque from BikeWise to The Friends of Darlingtom Memorial who are constantly raising funds for new equipment at the hospital. The donation is being put towards a new heart scanner which the hospital are hoping to purchase in 2009.